A set of 66 beautiful bible tabs completely handwritten by me. They are very unique and they will add that special touch of pizzazz to any bible, especially journaling bibles. Show your love for the Lord and his word by showcasing these one of a kind bible tabs! 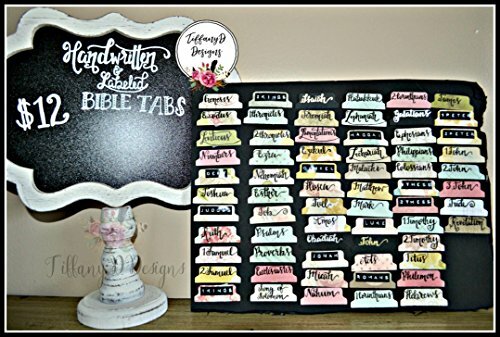 **THIS LISTING IS FOR A COMBINATION OF HANDWRITTEN AND LABELED BIBLE TABS. ** **These tabs are not self-adhesive, but you can use a glue stick or double-sided tape to adhere these tabs to the bible pages. ** I CAN CUSTOMIZE THESE TABS TO MATCH YOUR BIBLE OR TO YOUR SPECIFIC LIKING. Thank you so much for taking the time to look at my listings. If you have any questions about this product by TiffanyDDesigns1, contact us by completing and submitting the form below. If you are looking for a specif part number, please include it with your message.